The Nikon 200-400mm f4 G VR II AF-S ED Lens replaces the highly acclaimed AF-S Zoom 200-400mm f/4G IF-ED VR and features the new generation of Vibration Reduction technology (VR II), providing the ability to shoot at shutter speeds up to four stops slower so sharper images can be achieved. The 200-400mm f/4G ED VR II now incorporates Nikon's exclusive anti-reflection Nano Crystal coat to drastically reduce ghosting and flare, along with four ED glass elements to minimise internal reflections and aberrations and deliver rich, high contrast images even under testing lighting conditions. The new lens features an autofocus with a built-in silent wave motor to ensure fast and quiet focusing, while a new A/M mode added to existing M/A and M modes enables autofocus priority even if the focus ring is being handled during shooting. 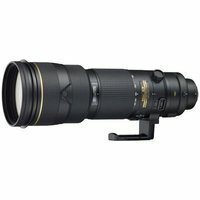 The Nikon 200-400mm f4 G VR II AF-S ED Lens has a tough magnesium body with weather sealing to withstand the effects of dust and moisture in the toughest of shooting conditions.